IMAP (Internet Message Access Protocol) is a Internet standard protocols for sending and retrieving emails from the server. GoDaddy.com allows you to send personalized emails. You can send and retrieve emails through its site. 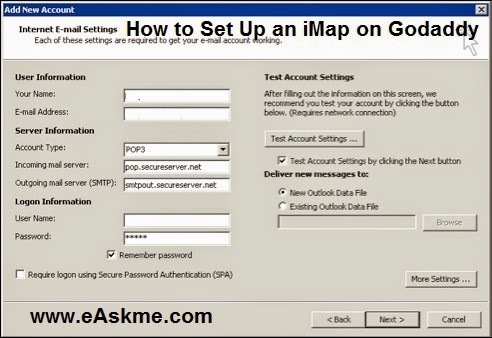 Setting up an iMap on Godaddy is very easy. How to Set Up an iMap on Godaddy ? Enter Name, user id, and enter password twice. Enter Name, Email Address and select "IMAP" in account type. Enter "mail.ex1.secureserver.net" in incoming mail server. Enter "smtp.ex1.secureserver.net" in outgoing mail server. Enter email address in "Username" and password of your email address. Click on "My Outgoing Server Requires Authentication". if you have selected SSL then use port 993 for your incoming server otherwise use port 143. For outgoing server use port 25 or 80 or 3535.